Having the right tools for the job can make any kitchen task more fun. Today, let’s talk about some favorites. I am a big fan of small kitchen appliances. I think it’s partly because I don’t like to get my hands dirty. Literally. I’m prone to dry chapped skin. Frequent washing prompts it to break out. And getting my hands dirty means I have to wash. So, I avoid getting my hands dirty. Weird, I know. Don’t worry. I wash my hands for food safety. But, I try to avoid unnecessary soap and water. That means I rely on my kitchen appliances to do the work for me. My food processor chops and slices. My bread machine kneads like the best of them. And my juicers make quick work of favorite beverages. Having the right tools for the job can make your kitchen tasks more fun, help you save time, and help you save money since you’re eating a home cooked meal instead of a processed frozen entree or pricier restaurant fare. But, I’m generally curious. 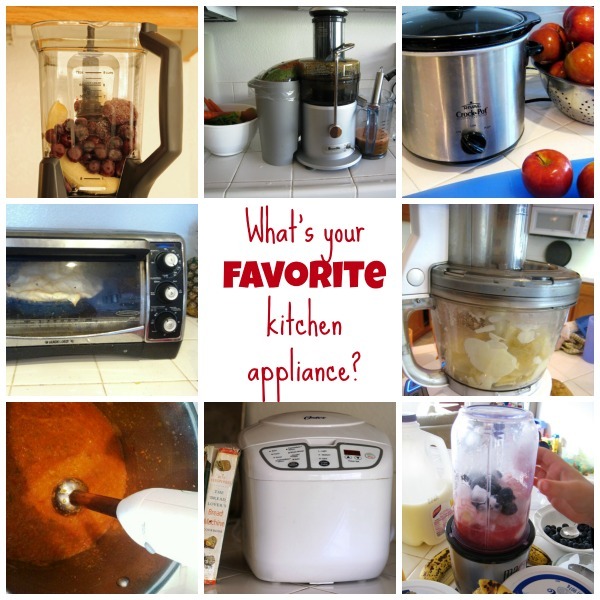 What is your favorite small kitchen appliance? What helps you the most in the kitchen? What do you think is a must-have? I personally am not a small kitchen appliance girl for multiple reasons. First I’ve never lived In a large enough space to warrant having small appliances. Normally I barely have enough space for plate, cups, utensils, etc. Secondly, I’ve watched Alton Brown for so long I probably hate uni-taskers more than him. Unfortunately small appliances are mostly uni-taskers. Too funny – I was thinking the same thing! I love my crockpot (use at least once a week) and my husband’s claim to fame is the Whirly Pop. He picked it up for next to nothing at a garage sell and it does make the best popcorn – tastes just like old timey movie theater popcorn. That’s a tough one! I think I’ll have to have the top 3: bread maker, crock pot & rice maker (I love how it makes the rice to perfection and then holds it till I’m ready!). I love all of my small appliances. It just depends on the job I’m doing which one I need. I keep all of them in my new pantry so they are never in my way. Some I use more frequently than others. I don’t use my stand up mixer too much because it’s easier for me to just grab my small hand mixer but at Christmas time when I’m baking lots of cookies, my stand up mixer always comes to the rescue where a hand mixer would never be able to do the job. Also I don’t use my food processor too much but when I need it, I’m always thankful I have it enough so that last year, when mine broke, I ran right out and got another one. Same thing with my bread machine. I tend to bake bread more in the winter than the summer; not sure why. Right now, we’re not eating too much bread. But this is another thing that I had to replace last year and replace it I did, the exact day my other one conked out. Seriously you want me to choose ONE? That said the real favorite might be my rice cooker – which is light enough that it can live elsewhere – and my crockpot that has no option but to live elsewhere – I do love to bake but can do it by hand – I love the way the rice cooker makes rice and we use it at least once a week – plus it can cook so many other things. And the crockpot just saves my behind time and time again. Hmm, my bread machine and yogurt maker get about the same use every week–2-3x while I use my blender every day. It’s a toss up, but I pick my Zojirushi breadmaker for the variety of yummies it produces. I haven’t bought store bread in about 3 years and I’m not sure we could ever go back! Without a doubt, my Westbend bread machine. My top two are the immersion blender and the coffee grinder. We have several ways to make coffee, and they’re fine, but without the coffee grinder I would be sad. The immersion blender has been the best present EVER. I definitely love all my small appliances but the ones I use all the time are my slow cooker and bread machine. However when canning season comes around I couldn’t live without my immersion blender and pressure cooker. It’s hard to pick one. I always said I’m not a “gadget” person. But I have gadgets now that I love, so I guess I can’t say that any more. ????. Favorite: Popcorn maker. My kids take plain popcorn (no salt, no butter) to school and/or eat for a snack after school almost every day. I use the popper probably four times a week, so it’s got to be my favorite small appliance. Biggest help: toss up between Kitchenaid stand mixer and Ninja Blender. Between the two, and the attachments for my mixer, my food processor is gathering dust in my pantry. Got the cheese shredder attachment for the stand mixer for Christmas. It has made me SO happy! Must have: Keurig. We have saved quite a bit of $ on coffee now that we can brew individual cups of our favorite coffee rather than pots that go to waste. Now this is a tough question. My most used kitchen appliance hands down is the Zo (Zojirushi) bread machine. Since I make all of our baked goods it gets a real workout. Add in sweet rolls and pizza dough and the poor thing is in constant use. My favorite though is the Presto Salad Shooter. It slices, it shreds, it grates and it turned my clunky Kitchenaid food processor into a big paperweight. The food processor now sits in the corner collecting dust. Other than at the holidays I rarely need a food processor any more. What I love most is the uniform thickness so whatever your cooking gets done at the same time (like potatoes for mashed potatoes). Or shredding potatoes for hash browns which is my husband’s favorite breakfast. The job of shredding potatoes used to take forever and I dreaded it. Now it’s done as fast as I chuck potatoes down the chute. Love that little appliance. I LOVE kitchen gadgets. I cook a lot and using new gadgets keeps it fun and exciting. That said, I do buy most of them at the thrift store so I have no guilt donating the item if it just doesn’t live up to the fun it promises. My crock pot is probably the most heavily used, followed by the Nespresso machine. Bread maker, vitamix, and food processor get used weekly. Space is an issue in my kitchen so most are stored in a corner cabinet and can be easily brought to the counter when needed. The slow cookers probably get the most use; hubby works a rotating schedule, and when he’s on nights I pretty much have to put something in the slow cooker before I leave for work in the morning in order to have dinner ready before he leaves at night. I just recevied my first bread machine for Christmas last year, and I love it. I have to avoid soy now, and all of the pre-made breads in the grocery store except one that was crazy expensive have soybean oil in them. I love being able to make my own bread and control the ingredients. And like you often say, home-made bread really takes a soup dinner from “ugh” to “wow”. I don’t use the standing mixer or waffle maker often, but I love having them around when I do want to use them, so they rate high, even though they’re not used daily or even weekly. I don’t have very many of the others in your list, though I am considering a food processor. I’m just not sure if it’s worth the space in a small kitchen. I use my bread machine with great frequency for kneading my standby recipes. Both my immersion blender and potato masher broke awhile back and I truly miss them. Also, seeing your various posts can see how helpful a kitchen funnel would be. It is a toss up between my slow cooker( I love it) and my Ninja blender! I can do so much with these two appliances! I use my Ninja 3 in 1 cooking system all the time. I don’t even bother to put it away. You may know, it has stove top settings, and an oven setting in addition to slow cooker. I fix “roasted” veggies in it all the time. So much nicer than heating up the kitchen with my oven on. Maybe a newer oven would put out less heat, but all I can say is, if my stove died, I don’t think I would feel the need to replace it anytime soon. That’s how great the Ninja is for me. I am also a great fan of crock pots of all sizes. Without a doubt, my crockpots. “Pattie” makes it possible and so much less stressful to have wonderful healthy meals ready for my family at lunch time while I work on math or science with my kiddos, and at the end of a “out of the house all day” day. It is also not uncommon to find a crockpot full of dry beans soaking, or cooking to fill in several upcoming meals. Currently I have 3 crockpots and they are all well used. The small appliances I use at least once a week are: stand mixer, slow cooker, rice cooker, toaster, the smoothie cup on my Ninja blender, and the waffle iron. I also have a bread maker that I mostly use for pizza dough, an electric griddle that gets used for family breakfasts, and a toaster oven that almost never gets used. I gave away the small-cup yogurt maker recently when I realized I would always use my slow cooker to make it and didn’t want to go back to tiny quantities for my efforts. Hands down my kitchenaid stand mixer! Got it for my wedding 17 years ago and its still going strong. I use it for everything: making bread, mixing meat loaf, even used the grinder attachment to make baby food when I had littles. I don’t think I could cook without it anymore! Just got a Vitamix and its really cool (close 2nd) but my mixer is my favorite! The things I use most are the bread maker, food processor, and Kitchen aid mixer. My favorites are my hand mixer, crock pot, toaster and waffle maker. I have others, but rarely use them. My top 3 are (outside of the coffee maker of course) crock pot, stand up mixer, and food prossesor. Bread maker used to ne on the list but now i do “bread in five minutes a day.” I love kitchen appliances!! I’m debating a pressure cooker for dried beans and other things. Aldi has one for $40 next week and it certainly looks like an “instant pot” that retails for 3x that price. SO tempted. I already have a slow cooker and rice maker and this is supposed to replace all those…hmm. Anyone have experience with something like this? I have many Aldi small appliances and have never had any issues. I use my Cuisinart Hand Mixer a great deal. I don’t have space for a large stand mixer, but this hand held one does what I need, cakes, muffins, quick breads, whipped cream. It’s well used, well loved. My immersion blender/mini chop gets the most use here. Kitchen aid mixer is another favorite. I guard my counter space like a hawk, so neither of them are actually on the counter! they do get prime cabinet space, tho. I also have a skin condition that makes it hard to wash my hands too often. My skin will dry out and start cracking terribly if it gets too wet and dry. I keep a box of disposable rubber gloves in my kitchen that I use for food prep — skinning chickens, making meatballs come to mind. Sometimes I even wash my gloved hands so I can keep going without taking them off! A freezer is simply mandatory, and I use the Crockpot very frequently. I don’t even have a bread machine or waffle maker or griddle or bullet. I have a blender and a food processor that I doubt I use even once a year. I do use the immersion blender on occasion, although it is mostly for soups so a ‘winter’ appliance. I adore the Kitchen Aid mixer, but that also does not get used so much at the moment. My kitchen (whole house!) is much smaller than yours, and counter space is at a bit of a premium, so only the truly popular items get to live there. I would do the same. We expand to fill the space we have, you know?